Dear Tim Lambert has tried to reply to my not found the hotspot post and The Skeptics Handbook. This is vintage spinmeister-Tim. Overall he claims I’m deluded, confused, constantly repeating discredited arguments, “doesn’t even know what the hot-spot is”, and “doesn’t understand how the greenhouses gases warm the planet”. But when it comes to backing up the giant patronizing put-downs, it amounts to nit-picking phraseology; irrelevant points; straw men; his own false understanding of what a fingerprint is; and then an own goal when he drops in a graph that shows that the hot-spot is indeed missing. Bear in mind Tim is supposedly attacking a scientific discussion. So what’s his first point? He’s googled me and uncovered, shock, that I’m married to another skeptic. (Disappointed you couldn’t find the Exxon link, eh Tim?) It’s always the first tool in an Alarmists armoury – dig up the funding, the lack of climate science publications, the extraneous membership to UFO clubs. When scientists do research, we look at data. When alarmists do ‘research’ they look up reputations. Point 2, Egad. I’m not novel. So? If you’ve heard these points repeated, it’s because they’re good points. Then the subliminal put down, Nova and Evans “share the same beliefs about global warming” - as if to smear me as unscientifically ‘faithful’ – yet inconveniently my ‘beliefs’ on global warming are the same as Tims. Yes the planet warmed. (We just disagree on the cause). Point 3, consists of three paragraphs from a depressed alarmist. (I’m being generous here, calling it a ‘point’). But it’s a chance for Tim to call me a pseudoskeptic by proxy (albeit an annoyingly popular one, shucks). Ad hom attacks, 1 – scientific reasoning, 0. Point 4, Then there’s the fascination at my capacity to be self-deluded. Which is, as usual, strong words backed by muddy thinking, poor reasoning and sentences that are not quite complete. (Incomplete sentences by the way, are not just ‘typos’ – if you are trying to explain a logical thought, it matters if you can’t form a proper sentence, because the meaning is ambiguous). Not so. By “fingerprint”, most people mean the whole fingerprint, not just one part. In fingerprints of the criminal kind, the whole visible pattern has to match. Any part that doesn’t automatically nulls the analysis. To prove that greenhouse gases matter, we need the tropospheric warming and the stratospheric cooling (as the models predict). The combination is the fingerprint, not just one or the other. 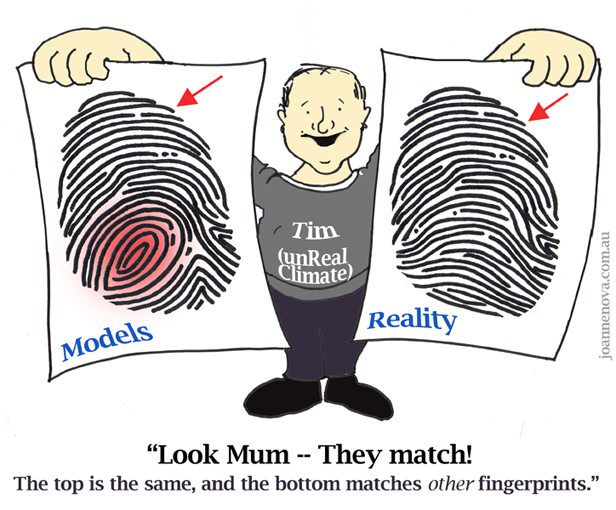 Even Tim admits we don’t see enough tropospheric warming, ergo, therefore, we don’t see the fingerprint. Tim tries to convince us that because the ‘hot-spot’ is apparent in other fingerprint patterns, it’s not unique, and so it doesn’t matter that it’s missing. Got that? It’s like saying all the suspects the International Police of Climate Change (IPCC) have lined up have different fingerprints to the ones at the crime scene. (Yes officer, we’ve convicted that man: the top half of the finger matches; the bottom doesn’t, but we’re SURE he’s guilty.) The mismatched fingerprints tell the rest of us that they haven’t caught the right guy. Even if ALL the causes the IPCC can think of produce a hot spot, the fact that it isn’t there tells us that the IPCC and all the models don’t know what caused the 25 odd years of warming in the 80′s and 90′s. But it’s not unique either, since Ozone depletion also causes stratospheric cooling. Oops. As usual Tim can’t quite get his sentence structure right, even as he asserts that I don’t know something that I do. In the Skeptics Handbook I explained the hot spot and the responses to it in less than 200 words so I simplified. For the public, who’ve never heard of the missing hot-spot, the distinction between ‘it warmed’ and ‘but it didn’t warm more than the surface’ is of debatable importance. So everyone agrees the models and thermometers don’t match. The point of contention is that alarmists say the models are right and so the thermometers must be wrong. But we skeptics are skeptical. Why trust a model, which is infinitely more complex and prone to error and manipulation than a thermometer? Why indeed—but then if you trust a UN Committee, why not? What kind of a debunking is this?—the irrelevant kind; mention who she’s related too, point out that it’s not ‘novel’, state that she doesn’t understand (even when she gets it right), and pull in comments from depressed bloggers who feel like they are fighting a losing war (because they are) and who write 600 words without referencing a single piece of evidence. As for James Hrynyshyn (the depressed blogger), I sympathize. Cut your loses now James; the repetition of points that you have no good answer to is about to become a downpour. Go on, become a real scientist, be skeptical, demand to see evidence! We’ll welcome yet another converted alarmist with open arms. That goes for you too Tim.